Join Gorilla Yogis for our last outdoor yoga class of the season. Let's down dog in the street in front of the Birchwood Cafe to celebrate community and Good Real Food! Join us on Sunday, September 13th for an old-school-all-ages block party for our neighbors, friends, and entire community. We’ll be open for Brunch from 8am–2pm, then the celebration starts at 11am with Gorilla Yogis and Big River Yoga in the street, followed from 2pm to 7pm by outdoor live music on the 89.3 The Current & Electric Fetus stage, plus local food & drinks from us (of course! ), Chef Shack, Café Racer, Izzy's Ice Cream, Peace Coffee, Sweetland Orchard, and Surly Brewing Co. Enjoy music from Clementown, Brass Messengers, The Sunny Era, and a community square dance with Ann Carter and friends. Kids of all ages will enjoy trivia from Trivia Mafia, Open Eye Figure Theatre puppet shows, face-painting, ArtiCulture activities, and a bee hive demonstration by The Beez Kneez. All that and MORE! 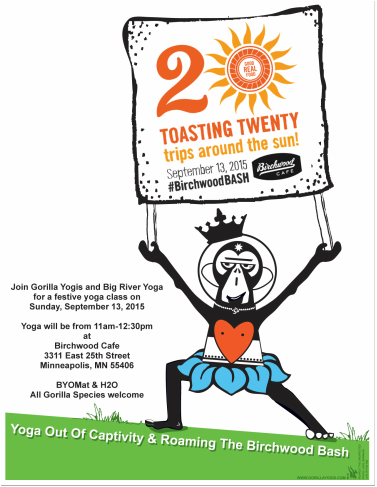 We can't wait to be #Toasting20 with you at #BirchwoodBASH! No previous yoga experience necessary. Right To Know MN is a campaign started by concerned citizens to make the labeling of GMOs the law in Minnesota. We are a coalition of farmers, health advocates, families, and others who support healthy foods. We're moms, dads, brothers, sisters, daughters, and sons, from all different walks of life, who believe we have the right to know what's in the foods we eat. GORILLA YOGIS are pure of heart revolutionaries ~ liven' in the OM. to connecting & creating a community of peace, love and bananas in the urban jungle. Do yoga, do good. One breath at a time.